Don't you like this annual flower combination? It's called the Hula Hoopla Confetti Mix trio. 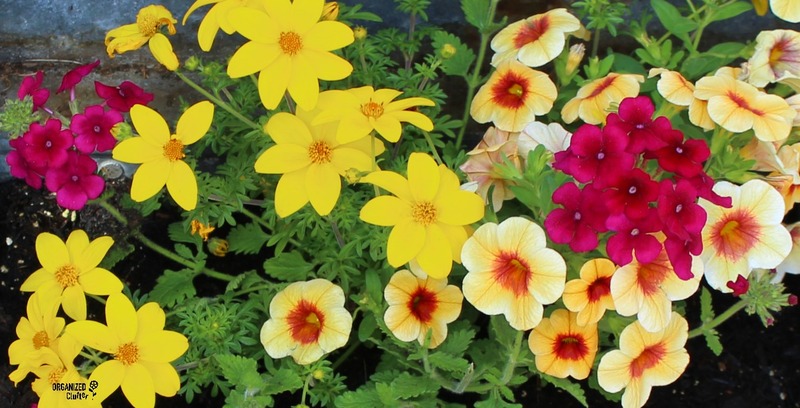 The mix includes Yellow Bidens, Cherry Red Verbena, and Hula Gold Calibrachoa. 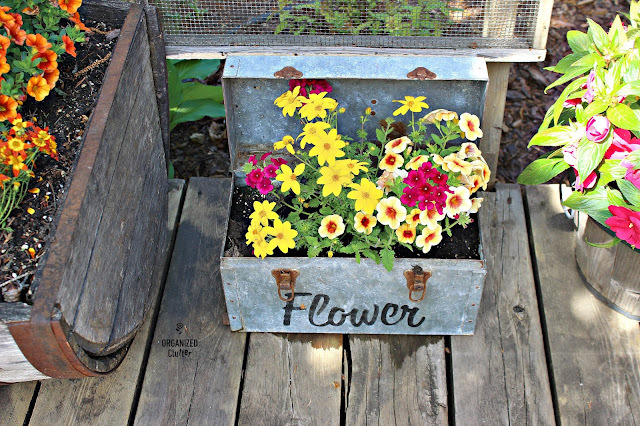 I found this Confetti Mix Trio Pot at Kmart, and planted it in one of my favorite junk garden re-purposed planter. I find I both save money buying the combos and since the plants are in bigger containers more advanced. 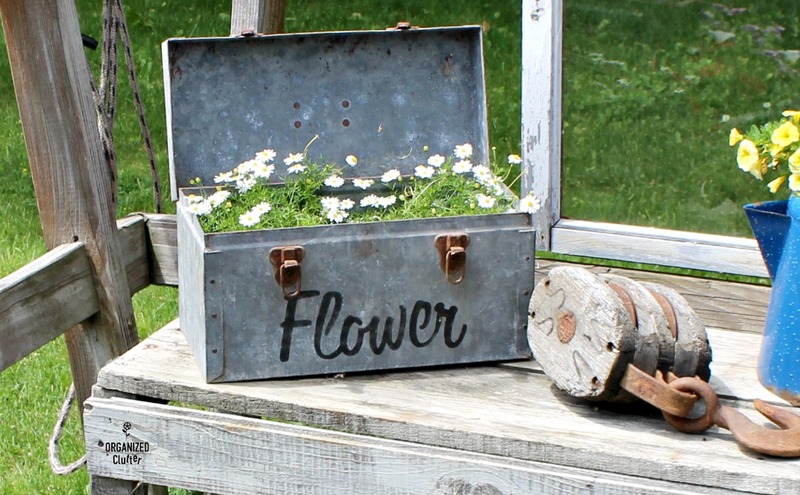 I found this galvanized tool box in 2014. 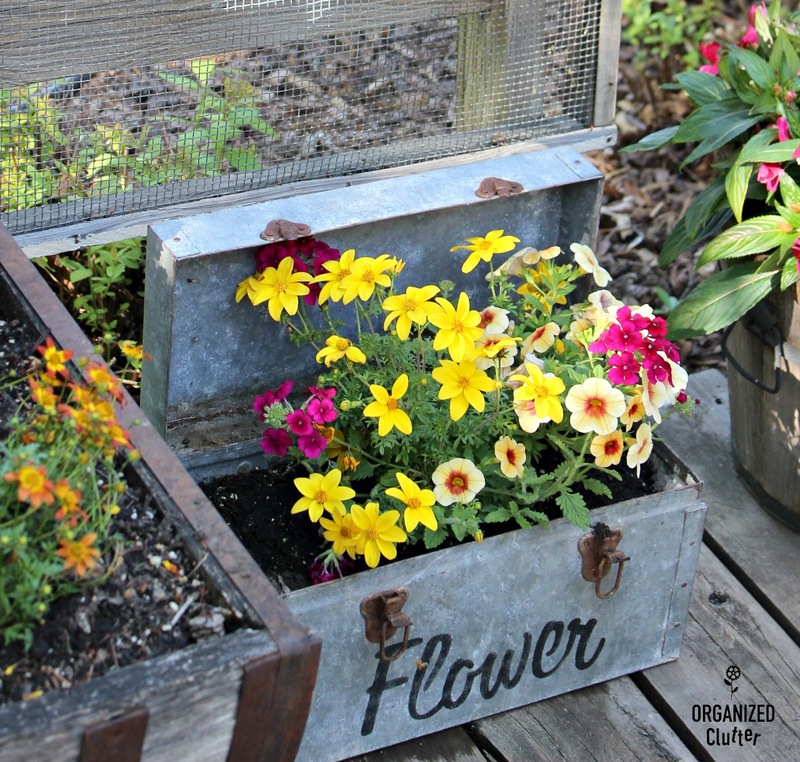 It is deep enough for a planter, the lid stays up on it's own, and it's GALVANIZED! What's not to love? I stenciled the "Flower" lettering on my toolbox planter with a Market Extension Flower Stencil from *Old Sign Stencils. 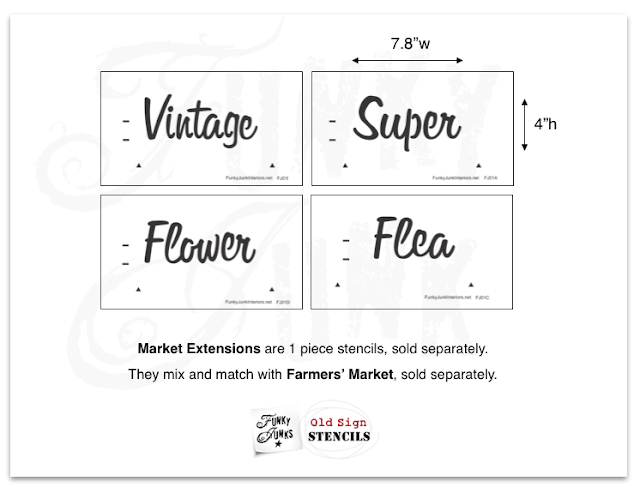 I use the "Vintage" and "Flower" stencil all the time. I used Ceramcoat Black Craft Paint for my lettering, and sealed the stencil with about five quick coats of Krylon Satin Spray. The stenciling has held up well even though it's an interior sealer spray. I love this colorful mix! I am so glad that I picked this $7 mixed pot for this planter! Of course I will report back on this planter in June and July! At first I was very protective of the tool box, and protected it under the roof of my covered patio. 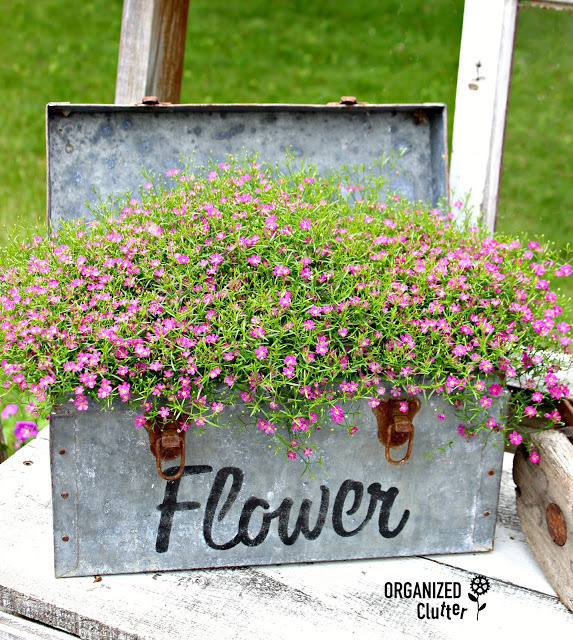 I planted it with coleus, and perched it on an really fun, rickety stool I got from my Junkin' Friend Jodi! The next year I hung the tool box from the handle on a hook from my deck rail. It's planted with a calibrachoa and a petunia. This was a great look. I stenciled the tool box during the third season. I planted it with annual rose or pink baby's breath, and set it on a bench on my deck. Last year I planted the toolbox with white Swan River Daisies. I think this idea was my least favorite! 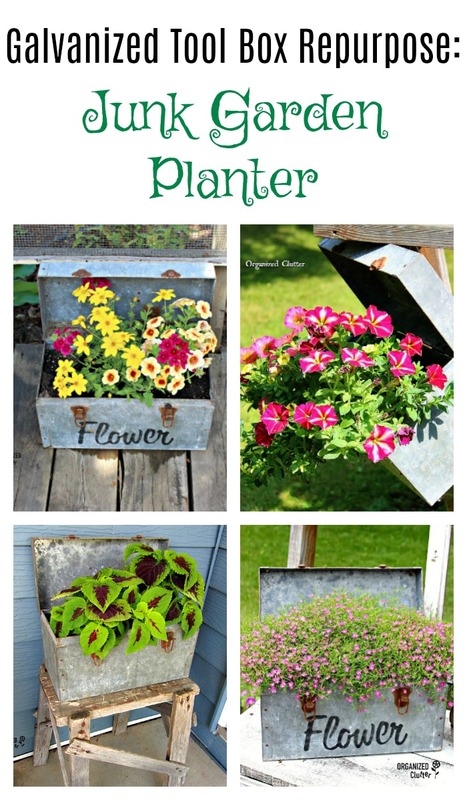 Do you have a favorite planter? I adore seeing how you style your metal pieces with beautiful flowers. :) You have a gift my friend!! Looks wonderful!! I love them all!